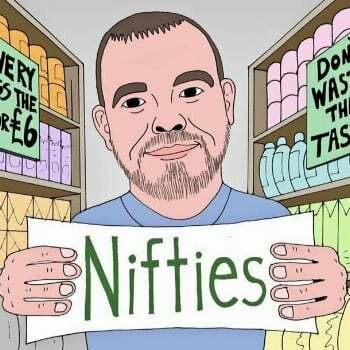 Recycling £13 billion worth of food from waste to taste, Nifties stops edible food from being thrown away for those in need. Every year, £13 billion of food ends up in a landfill in UK alone. This isn't just stale bread and mouldy produce. This is good to eat food of all sorts. Produce, dairy, grain, protein, and everything outside of those. Yet, over one million Brits relied on food banks last year and 8.2 million are "food insecure", of which 2.5 million are children. So I started re-evaluating my outlook on life and saw some massive problems with the UK like why are so many going hungry despite being one of the richest countries on earth? So I started Nifties. I gave up my part time job with just £500 and started nifties what made me do this you ask? I've used food banks I've experienced poverty first hand with my own unemployment I came out of college in 2008 to find a country in recession but yet I've always seen how wasteful the companies in the country are despite this. So I made a few phone calls in May to a few cash & carries asking about the items they are throwing away because of their appearance rather than safety and luckily one company invited us over to take them away. I've wanted since I've had children to leave the Earth in a better place than when I was born into this world, now how can I fulfil that goal if I blindly accept that over 1 million (including myself) have used foodbanks but yet there is a huge source of food being thrown away for no good reason. So onto facebook me and my wife went to sell these goods for significantly less than any supermarket could dream of. We hit the ground running and fast forward 2 weeks and we had enough business to set up a pop up shop in the Charlton Shopping Centre in Dover. We caught the eye of the Daily Mail and they published us in their paper we was so busy in the first day we had to close as we sold out of everything! In just under 2 years we've grown substantially had to relocate twice to cope with our growth and influx of goods! Now we are at the cusp of reaching out to communities up and down the UK however we lack the infrastructure to cope with demand.